According to the UN, more than 4 million refugees have fled Syria, among other countries, for neighboring countries and Europe. The humanitarian crisis is complicated, dramatic, and tragic, as we so sadly observed in the toddler who washed ashore a Turkish beach. As the international community figures out how to help the refugees, some debate has flared over what to call these humans displaced by horrible events in their homelands. At The Wall Street Journal, lexicographer Ben Zimmer weighed in on loaded history of the term refugee. Finding structure in fleeing. “Apophyge.” Ink on paper. Doodle by @andrescalo. Also relevant to recent headlines about the Iran nuclear deal is centrifuge. The earliest form in English, centrifuge, was an adjective, “center-fleeing.” Isaac Newton coined the term centrifugus in his groundbreaking studies of mechanics. He also counted its opposite, centripetus, “center-seeking,” which yields centripetal. The current refugee crisis is wrenching, but there may be hope yet, if Germany and etymology are any measure. Fugere and fuga also generated febrifuge, an old term for a “fever reducer.” Febris is Latin for “fever.” Related are feverfew and featherfew, names for a plant historically used to help fight fevers. And we have the beauty of a fugue, whose defining counterpoint suggested “flight” in its original Italian formulation. But it’s going to take a lot more than music and medicine to resolve the crisis. It’s going to require systematic structure and support – across the world, not to mention within Syria. 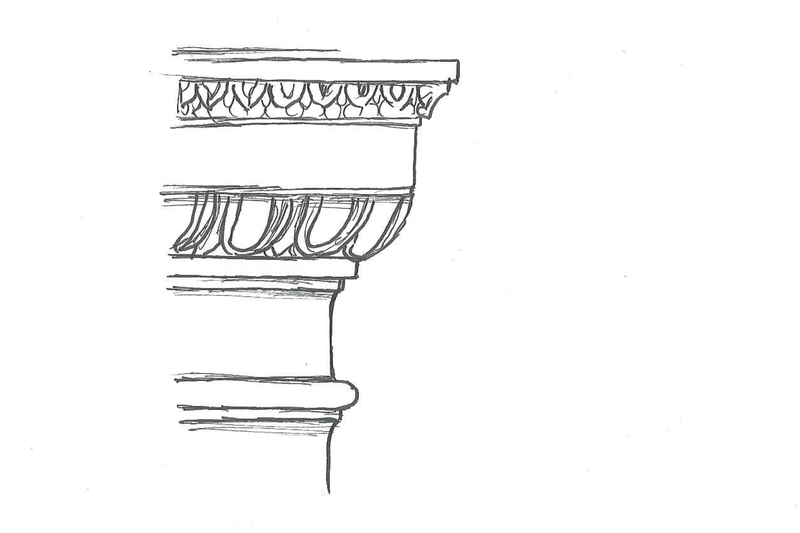 Much like what is provided by a surprising architectural cognate of refugee: Sturdy and load-bearing pillars or columns, whose apophyges curve from the shaft into the capital or base. The word is from the Greek ἀποϕυγή (apophyge), “escape,” from a verb (φεύγω) meaning “to flee,” describing the way a column’s shaft “escapes” into its head or base. I was looking up “refugee” in my old Welsh dictionary which in Welsh is ffoadur (“ffo” from Latin “fuga” plus agent suffix “-adur”) and noticed one of the English synonyms included the word “runagate” – never heard of that word before? Could it be a variant spelling of “renegade”? I did look up “runagate” later which confirmed that it is a corruption of “renegade” as you surmised. This is an interesting and diverse list, what with “déifuge” and “météorifuge.” Too bad the suffix didn’t become productive in English. I wonder if there is a more ‘native’ equivalent? The suffix “-fuge” in English doesn’t have an instantly recognisable or inherent meaning as it does to Francophones where in French an “enfant en fugue” (runaway child) “faire une fugue” (runs away) from the verb “fuguer” (to run away) and I can’t think of any thing that could be suggested as a more ‘native’ equivalent? Closest I can think of would be something akin to “elope” (French v. s’enfuir; n. fugue amoureuse). We do have “bug off” or stronger expressions. Certain brands or products stateside will use “-off” or “-away,” to boot, to express the repellent concept. Ah, sorry. I slightly misread your “I wonder if there is a more ‘native’ equivalent?” reply and was thinking more generally when I suggested “(e)lope” as a more native equivalent for the Latinate suffix usage of “-fuge”. Bearing this in mind I’d suggest that there already are words in English with a quasi-suffix comparable to some of the French “-fuge” suffixed ‘x-repellent’ words ie. “cimicifuge”, “ténifuge”, “vermifuge” (insect/tapeworm/worm repellent) namely the “-bane” formed vernacular plant names: bugbane, dogbane, fleabane, henbane, mousebane, ratsbane (arsenic), sowbane, wolfsbane. Fascinating post. I love word origins. Connecting to the current humanitarian crisis was very timely. https://biancosporcom.wordpress.com/2015/10/07/la-cicatrice-bianca/ follow my blog? o like it 🙂 Tanks!